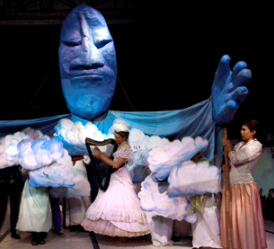 Bread and Puppet Theater will take over the Cyclorama at the Boston Center for the Arts, at 539 Tremont Street in the South End, to present "The Possibilitarians," "Dead Man Rises," "The Circus of the Possibilitarians" and a Cheap Art Sale from January 24 - 27. As well, an Art Exhibit will run from January 21 - 27. Commencing its 50th anniversary of presenting in-earnest, socio-political puppetry, the long-standing, award-winning Vermont-based Bread & Puppet Theater, featuring Artistic Director Peter Schumann and his troupe of puppeteers, is returning for its 6th annual visit to the Cyclorama, bringing its signature powerful imagery, masked characters, and giant paper maché puppets. Bread & Puppet Theater is one of the oldest and most unusual theatrical companies in the United States. The theater champions a visually rich slapstick style of street-theater filled with huge puppets made of paper maché and cardboard, combined with masked characters, improvisational dance movement, political commentary, and a lively brass band for accompaniment. The company’s performances have been described by The New York Times as "a spectacle for the heart and soul." Based on a large farm in Vermont's Northeast Kingdom, the company was founded by artist-dancer Peter Schumann in 1963. For the next decade his giant puppets figured prominently in anti-Vietnam War demonstrations in New York City, Washington D.C. and other cities in the US and abroad. This year, the one week residency includes the evening double bill of "The Possibilitarians" and "Dead Man Rises" (recommended for ages 12 & older) and weekend matinee performances of "The Circus of the Possibilitarians" (for children of all ages). All the visuals are created by Schumann, including the sculpting and painting of all the major masks and puppets, with input from the company. "The Possibilitarians" and "Dead Man Rises"
"The Possibilitarians," a play with live music and giant puppets, advises present day occupiers, uprisers, and possibilitarians to learn from the 17th century diggers and levelers, and to start digging and leveling and opposing and countering the crumbling economic system and its inherited misrelation to Mother Earth. "Dead Man Rises" is a fairytale-like, life-size puppet show originally created by Bread & Puppet in the mid 60's, most notably performed as part of the student occupation at Columbia University in New York City in 1968. After each performance, the audience is invited to join an informal talk-back with the artists, to eat home-made sourdough rye bread with aioli, and to peruse the Cheap Art for sale. "The Circus of the Possibilitarians"
"The Circus of the Possibilitarians" is a satirical horse and butterfly circus, addressing pertinent national and international issues in a clownish fashion, including rotten ideas, a wild dancing horse and some mellow lions, a solemn salute to the world's casualties and much more. The Dire Circumstance Jubilation Ensemble provides a little bit of brass and plenty of noise. Note that if some of the circus acts are politically puzzling to adults, accompanying kids can usually explain them. After each performance, the audience is welcome to examine all the masks and puppets and to peruse the Cheap Art for sale. For this residency at the Cyclorama, both the evening and matinee performances will be performed by Peter Schumann, the Bread and Puppet touring company, and a large number of local volunteers and musicians, including the popular Somerville-based Second Line Social Aid & Pleasure Society Brass Band, which serves as the house band for Bread & Puppet’s Boston performances and is also the host band for the annual HONK! Festival held in October in Davis Square, Somerville. For tickets and information, call 866-811-4111 or visit www.breadandpuppet.org. For information regarding the week’s events, visit www.bcaonline.org.